While Danbury is still nicknamed the Hat City, the topper industry had frayed by the 1920s, as had many of the textile businesses in New England’s industrial towns. But some of the old hatting factories pivoted to other manufacturing operations, and Union Savings Bank has been part of that revitalization process. 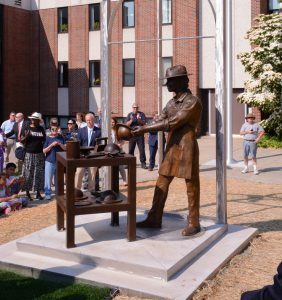 Union Savings Bank unveiled a monument to hatters in celebration of Danbury’s history as part of the bank’s sesquicentennial celebration. To this day, as we celebrate our 150th anniversary and the bicentennial of mutual savings banks, we continue to see our role not only as a community resource that helps businesses capitalize, but also, when necessary, as a catalyst for transformation. It’s a philosophy that has yielded numerous success stories, from a local dry cleaner who has added innovative new business offerings to a family-owned farm now functioning as an amazing new event space and agri-tourism destination. It’s the answer to the question of how banks can stay relevant and customer-centric in today’s hyper-competitive, always-changing financial services industry—one that preoccupies our team at Union Savings Bank every day. Our answer comes from our heritage, founded in 1866 by a group of local businessmen to safeguard the assets of friends and neighbors. It has always been grounded in the belief that regardless of outside influences—from wars to politics to new regulations—community, employees and customers matter most. As a mutual bank, we of course have the advantage of taking a long-term view, and that’s especially critical as the speed and pace of change only continue to accelerate. Today, all of us are devoting an incredible amount of human and capital resources to managing compliance and regulatory issues. 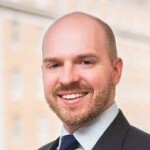 While this investment is unavoidable—and in many instances critical as technology-driven risks such as cyber attacks escalate—many hours and much talent now must be spent on areas of the business that ultimately have little to do with delighting customers. I’ve been working in our industry for more than 26 years, both in the public and mutual banking sectors, and it’s getting more and more difficult to deliver service at the same level as even just a decade ago. The opportunity to focus solely on helping the business owner sitting in front of you is affected by the need to be mindful of the regulatory requirements that affect the customer interaction. To drive innovation and transformation, we’ve taken numerous steps. For example, when we began to notice the lack of commercial lending training, we launched our own internal program to ensure we were developing the next generation of credit-skilled officers. To bring more young talent into our industry, we’ve invested in management training programs and we’re sending employees to top graduate banking programs to establish stronger career paths. Connecticut is one of many states experiencing a “talent drain” as a result of economic challenges and I think it’s part of our civic duty as mutual bankers to do what we can to help create jobs—starting within our own walls. It’s equally important to get input directly from the people you’re trying to reach, so I have begun regularly scheduling informal get-togethers with groups such as our younger employees and consumers to discuss how we might attract their attention. Another step has been to recognize that today’s business owners simply don’t have time to work their way through traditional bank silos. We’ve made a big commitment to breaking down those walls with initiatives such as our new concierge-style “solutions teams.” We give business customers a team of professionals in their immediate market that can assist with any need, from lending to personal services. One of the key differentiators of mutual banks is, of course, our very structure. Our customers and employees, along with the communities they live and work in, are in effect our shareholders. Profitability for us means more funds to deploy within our communities. It’s an area where we’ve made big investments. This year will be the first full fiscal year for our new community relations group, a full-time team exclusively dedicated to ensuring that Union Savings Bank delivers on our community service commitment, from our 20,000 staff volunteer hours to nonprofit board service to hyperlocal giving decisions made in each branch. And our annual grants program, administered through our own foundation, gives everyone in Connecticut the opportunity to apply for local initiative-supporting funding. This year we will award more than $500,000 to programs and organizations focused on education. Like everyone else in our industry, we’re busy creating products and services to harness the power of technology and address the changing preferences of customers. But the most critical response to an evolving banking environment has been to stay grounded in our 150-year-strong mutual bank roots, ensuring that our past is part of our present while we continue to innovate and evolve. That’s why we created a customer service charter last year. With the help of our employees, we inventoried every component of our business, agreed on how we would deliver on our commitment to service and what type of training team members would need to really live that vision. Mutual community banks have the privilege of not being tied to passing trends or even dominant economic forces. If we were, Union Savings Bank would have perished with Danbury’s hat factories. We’re here to serve our communities and customers, regardless of what the economy looks like. In fact, with their staying power, mutual banks like ours have the ability to build tomorrow’s economic future. As we celebrate our 150th, we’re looking forward to what banks like ours can catalyze in our hometowns. Cindy Merkle is president and CEO of Union Savings Bank in Danbury, Conn.